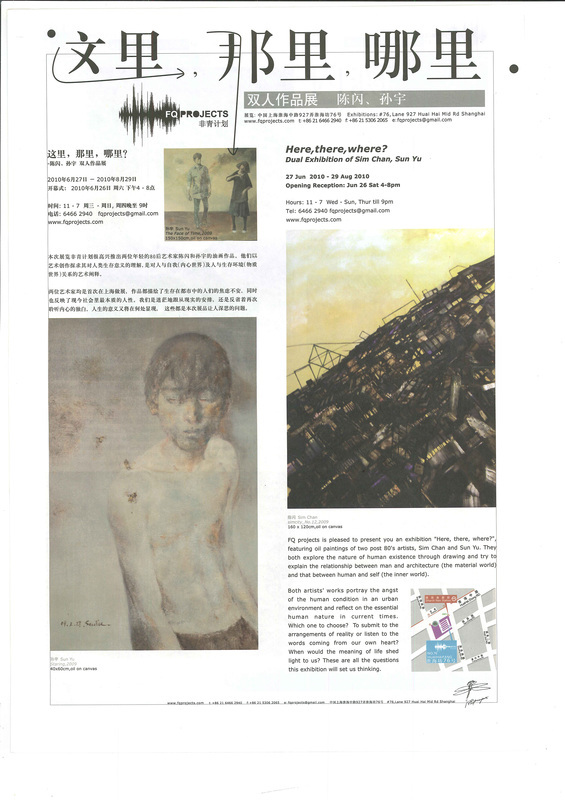 FQ projects is pleased to present you an exhibition “Here, there, where?”, featuring oil paintings of two post 80's artists, Sim Chan and Sun Yu. 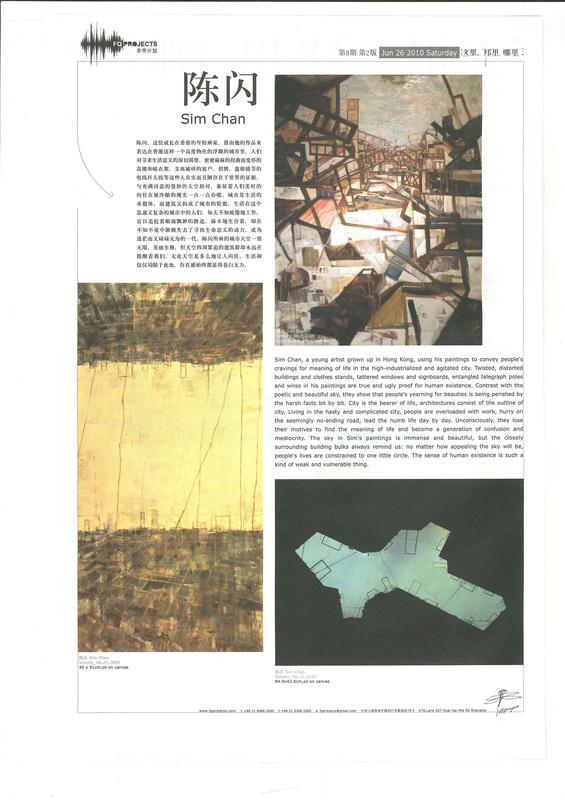 They both explore the nature of human existence through drawing and try to explain the relationship between man and architecture (the material world) and that between human and self (the inner world). Sun Yu exploits his excellent painting techniques in the unfashionable field of portraiture. He vividly catches the emotional sensation of the subjects and draws them on canvas to convey the ephemeral feeling to viewers, enabling the subjects to become lifelike and communicate with viewers. The people and scene in his paintings don’t have any concrete indications. With vague backgrounds and faces frequently used, the realistic parts such as an expression in one’s eye or a movement of the subject become prominent. Happiness, aspiration, loneliness, sorrow and unrestraint, these delicate emotions are common in the life of youngsters in 80’s but they want to cover them up from being known by other people. 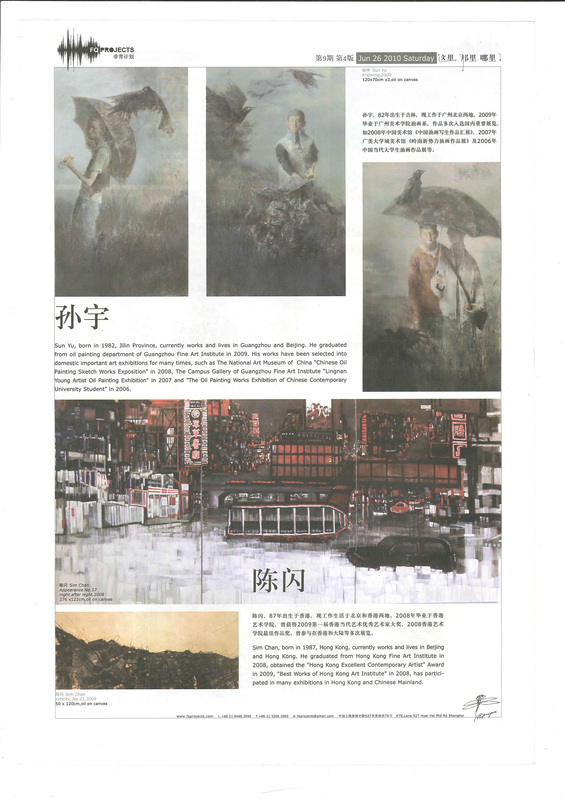 Now Sun Yu has reproduced them in the form of art, using his paintings as a mirror to evoke the true internal resonance in viewer’s heart. As we all know, the emotion of modern people is a reflex of social and economic environment. Sun Yu sincerely depicts the helplessness and emptiness of spiritual world which he and his peers share by exploring the subtlety and fineness of inner world. Just as he maintains, time is invisible but can be felt clearly and definitely, only among the invisible time can the emotion be outstanding. Although time elapses and everything changes, we may experience some moments we once had, the same as the subjects have in Sun’s paintings. 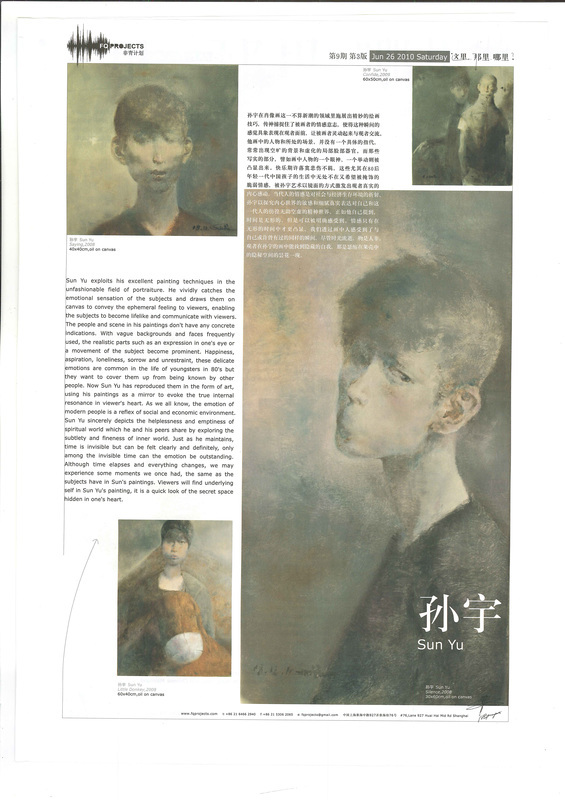 Viewers will find underlying self in Sun Yu’s painting, it is a quick look of the secret space hidden in one’s heart. Sim Chan, a young artist grown up in Hong Kong, using his paintings to convey people’s cravings for meaning of life in the high-industrialized and agitated city. Twisted, distorted buildings and clothes stands, tattered windows and signboards, entangled telegraph poles and wires in his paintings are true and ugly proof for human existence. Contrast with the poetic and beautiful sky, they show that people’s yearning for beauties is being perished by the harsh facts bit by bit. City is the bearer of life, architectures consist of the outline of city. Living in the hasty and complicated city, people are overloaded with work, hurry on the seemingly no-ending road, lead the numb life day by day. Unconsciously, they lose their motives to find the meaning of life and become a generation of confusion and mediocrity. The sky in Sim’s paintings is immense and beautiful, but the closely surrounding building bulks always remind us: no matter how appealing the sky will be, people’s lives are constrained to one little circle. The sense of human existence is such a kind of weak and vulnerable thing.